Alberti's Window: Lorenzo de' Medici: Destroyer of Art? Lorenzo de' Medici: Destroyer of Art? Lorenzo de' Medici (also known as Lorenzo the Magnificent) is well known for being a great patron of the arts during Renaissance in Florence. 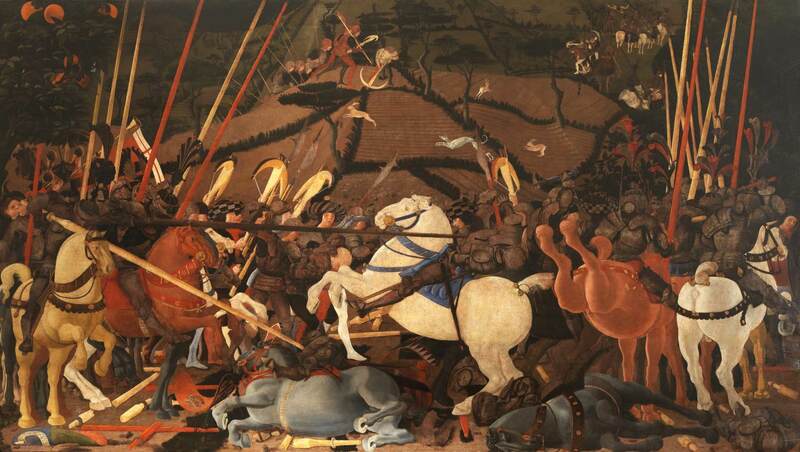 However, it is also supposed that Lorenzo de' Medici may have destroyed (in part) a series of paintings in his collection: Paolo Uccello's The Battle of San Romano (c. 1435-56). Do you notice anything curious about these paintings? There aren't any depictions of the sky, and the large flag in the National Gallery panel has been cropped. 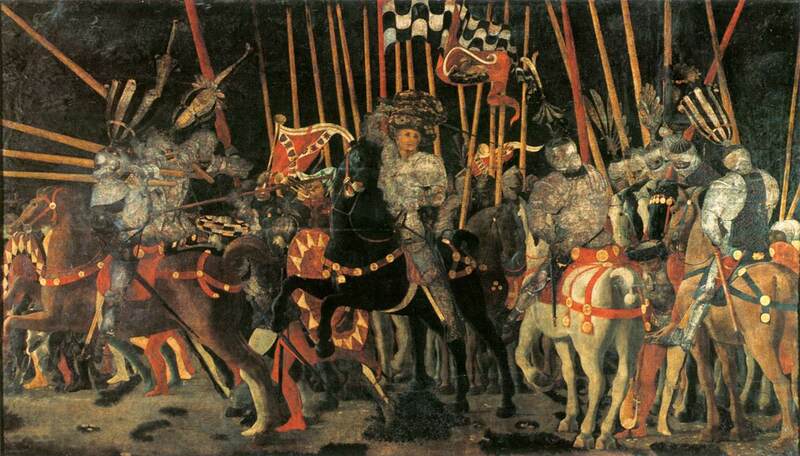 And, surprisingly, the panels were probably cut under Lorenzo de' Medici's direction. After Lorenzo de' Medici gained possession these panels (he stole at least one of them from its rightful owner), Lorenzo probably cropped the paintings so they would better fit on his bedroom wall. Originally, Uccello's panels were arched at the top (they were originally commissioned to be placed on walls with vaulted ceilings) and likely included bits of sky. Restorer Leo Stevenson has recreated one of the Uccello panels to how it may have appeared originally (see right). Do you like the panel better with a patch of sky? I do. But as J and I watched "The Private Life of a Masterpiece" episode on the Uccello panels, he commented that he actually liked the cropped paintings better. J thinks that the confined, restricted scenes help to emphasize the chaotic feeling of battle. I think this is an interesting idea. Would Lorenzo de' Medici have preferred the cropped painting for this same reason? Maybe. But it seems like Lorenzo's motives were more practical than aesthetic. I'm disappointed, though, to know that such a well-known patron of the arts took the liberty to hack off a portion of Uccello's panels. 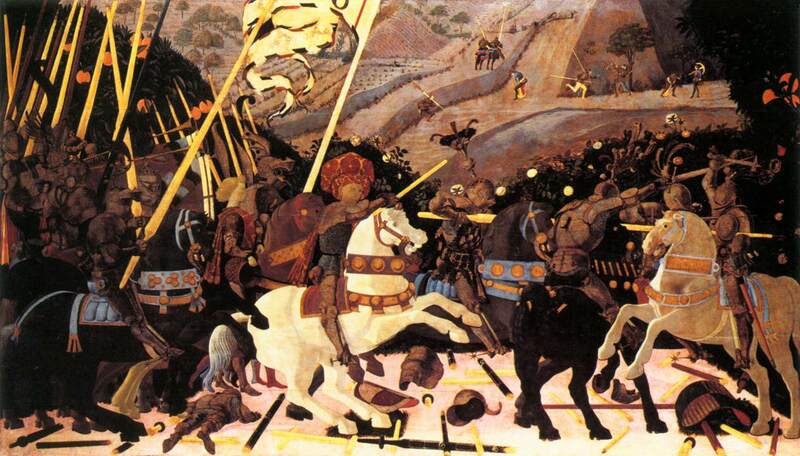 The Battle of San Romano is one of the featured works of art in "The Private Life of a Masterpiece" BBC series. If you're interested, you can win a copy of this episode by entering my giveaway to receive a free DVD set of "The Private Life of a Masterpiece" BBC series. Hurry and enter! The giveaway ends tomorrow, 30 June 2010.